Most addictive behavior is rooted in some type of loss, be it the death of a loved one, coming to terms with limitations set by chronic health problems, or the end of a relationship. By turning to drugs and alcohol, people who have suffered a loss can numb their grief. In the process, they postpone their healing and can drive themselves further into addiction. The Mindfulness Workbook for Addiction offers readers an effective program for working through their addiction and grief with cognitive behavior therapy (CBT), dialectical behavior therapy (DBT), and acceptance and commitment therapy (ACT). 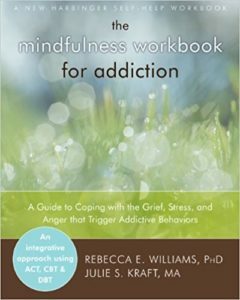 Created by a psychologist who works for the Department of Veterans Affairs and a marriage and family therapist who works for Sharp Mesa Vista Hospital, this mindfulness training workbook is effective for treating the emotion dysregulation, stress, depression, and grief that lie at the heart of addiction. No matter the loss, the mindfulness skills in this workbook help readers process their grief, determine the function their addiction is serving, and replace the addiction with healthy coping behaviors.